1 Line a baking sheet with wax or parchment paper. Process chickpeas, nut butter, brown sugar, vanilla and salt in a food processor until smooth. Transfer to a medium bowl and stir in chocolate chips. Using a 1-teaspoon measure, scoop the dough onto the prepared baking sheet. Cover with plastic wrap and freeze until firm, at least 1 hour. 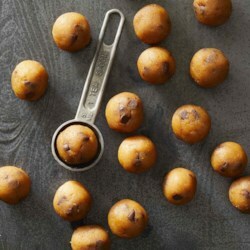 To make ahead: Freeze cookie dough balls for up to 2 months.